Professional “networking” is not a new concept. Offline, general purpose professional networking groups like Toastmasters and Rotary Club have been around for years. The first unofficial Toastmasters meeting was held in the early 1900s, long before the first computer, much less the Internet. These mostly offline professional networks provide opportunities for professional development and localized business networking opportunities. Online, LinkedIn is the largest general purpose professional network, with more than 400 million members. Other online general purpose social networks, including Twitter and Facebook, are starting to deploy solutions targeting professionals, although FB@Work is seemingly more of a competitor to solutions like Slack or Microsoft’s Yammer due to its internal enterprise focus and emphasis on messaging. General purpose networks have the potential to introduce you to a broad range of professionals with varied perspectives, skills and information to share. They are mostly focused on career development, self­-promotion through self­-publishing and job­-seeking. For example, LinkedIn’s Talent Solutions still dominates annual revenue at 63 percent of total 2015 revenues, according to The Motley Fool. Beyond general purpose professional networks, industry­-specific associations like the American Banker’s Association (ABA), National Association of Realtors (NAR) or the American Medical Association (AMA) have also been around long before the Internet and have created venues for professional networking at periodic trade events and annual meetings for members. 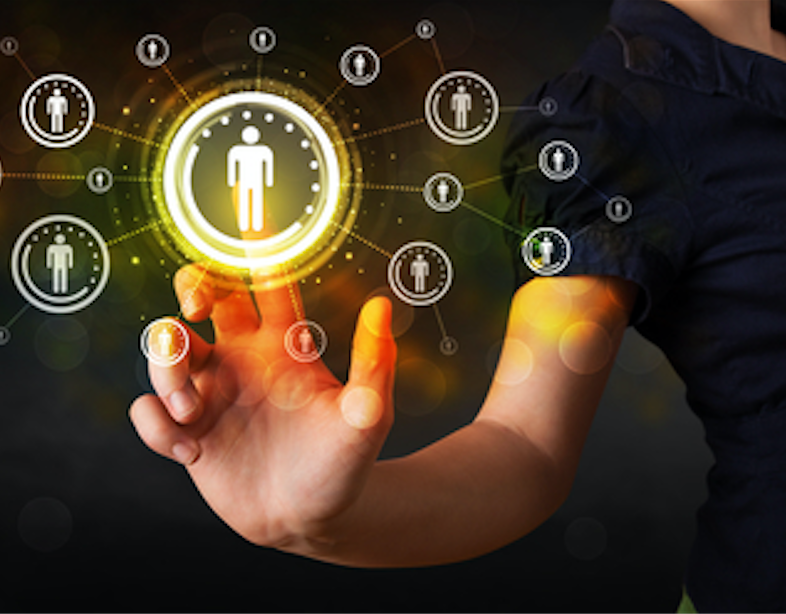 Like LinkedIn, these traditional associations also provide their members with opportunities for career development and job­-seeking, but go further to connect professionals within a common industry domain, providing an advantage over general purpose networks to help solve very specific problems encountered during the workday. Doctors understand doctors, realtors understand realtors and bankers understand bankers and the unique problems they face in operating their businesses and advancing their professions. 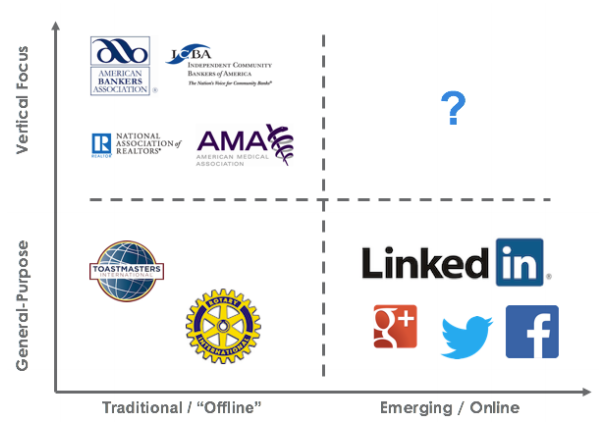 But a limitation of these (mostly) offline trade associations is that they lack robust “social” features that are common with online professional networks. They lack features to help you discover even more people who are best­-suited to help you solve problems, beyond the in-person events; professionals who are highly regarded in the community—by the community—for their specialized expertise. At nearly every association annual meeting or trade show I’ve attended, I’ve met at least one extra smart person, let’s call him “Bob,” who I know I can count on to help me solve problems I may run into during the workday, long after the trade show is over. Bob knows my industry, can relate to my challenges and help me solve specific business problems at work. I like Bob, and in return I want to help Bob and other people like him. But what if I could discover ALL the “Bobs” in my industry who could help me, and I could interact with them individually or as a group anytime I needed them? And what if I could see what the rest of the industry thinks about them and how much my peers trust their opinions and expertise? There’s an emerging segment of online professional networks oriented around a specific industry vertical or job function that combines the online social networking benefits of general purpose networks like LinkedIn with the deep industry knowledge of traditional trade associations. And they’re cropping up in many industries, from IT to academic research, medicine and banking. There’s a trend toward much more specialization with networks that are more focused, and therefore often more valuable. than 60 percent of U.S. physicians are verified members. That’s more members than the American Medical Association, which was founded in 1847. Doximity launched in 2011. ResearchGate, the Berlin­-based online vertical professional network for corporate, academic and medical researchers, offers a free tool to identify published works of researchers and the number of citations your research has received. The company generates revenue through targeted advertising and recruiting solutions. These networks all help professionals do their jobs better by giving them access to a targeted group of people who understand the intricacies of their trade and also provide specialized tools and apps to solve specific industry problems that go beyond general purpose information-sharing. 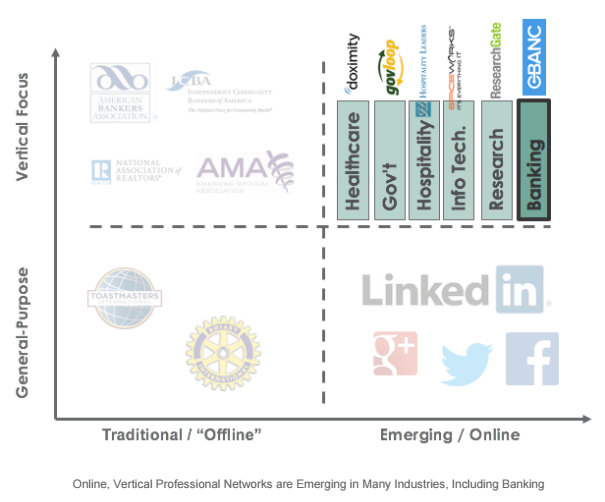 And more and more bankers are turning to the the online professional social network for the banking industry for help: the CBANC Network. Stay tuned for Part III of Bankers Get Social, a four­-part blog series written by CBANC CEO Bryan Koontz.